The Lanzar Aquatic Waterproof Marine Stereo Radio Receiver System has the ability to stream your audio wirelessly. Built-in Bluetooth technology allows you to instantly play music via your smart devices -- quickly and easily! Connection is simple and it works with all of your favorite devices, like iPhone, Android, Smartphones, iPad, Tablet, etc. The digital circular design is universal and installs into your vehicle's instrument panel / dashboard compartment, fitting into the standard size rounded tachometer gauges. Upgrade your marine watercraft with versatile digital and wireless sound ability, all while maintaining marine grade waterproof performance. The system features additional 'plug and play' music streaming thanks to MP3 digital media file compatibility. Connect your USB flash drive to stream a playlist, use the RCA audio jacks to connect even more external devices or tune in to AM/FM Radio. Control it all with the front panel LCD display with touch button controls. 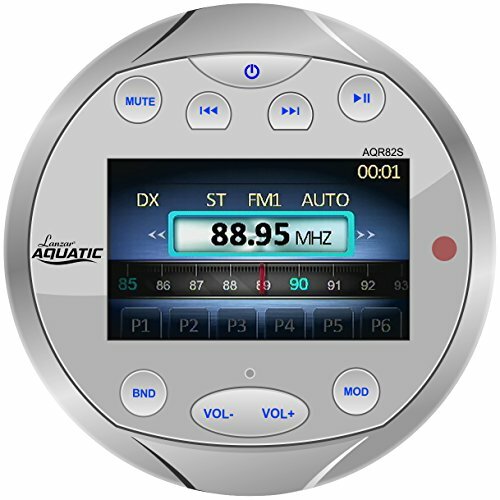 The screen also features ID3 Digital Tag Readout Support that displays the song artist and title of your digital music files. The Lanzar Aquatic Bluetooth Marine Receivers let the music flow while you stay afloat! FRONT PANEL CONTROL: This unit features front panel controls with LCD digital display and all necessary buttons including mute, seek, power, play / pause, mode, volume, reset and band that illuminates in the dark.